Sydney, from its origins in 1788, grew with minimal attempts at planning. This didn’t matter so much while the city was small but in 1945, in anticipation of the rapid post war increase of population that occurred, the Cahill government created the County of Cumberland in order to prepare a master plan for the Sydney region. As motor vehicle traffic was also increasing the plan needed to look at ways of coordinating private and public transport. Although there were other issues, such as industrial pollution and unsympathetic architecture, that led to the founding of The Glebe Society it soon became clear that the greatest threat to the suburb was the proposal of the Department of Main Roads to build the expressways through Glebe. As the Society’s president Peru Perumal later wrote, “… if the proposed expressways were built as planned, they would isolate a very closely knit community into three distinct sections. These sections would not have natural topographical, geographical, sociological or townscape divisions”. Denis Winston’s book Sydney’s Great Experiment clearly shows plans for the Cahill Expressway across Circular Quay and the Western and North-Western Expressways through Glebe. The Western Expressway was to join the Great Western Highway west of Parramatta and the North-Western was to cross the Parramatta River at Gladesville and join the Pacific Highway north of Mt Colah. The Society’s Town Planning SubCommittee, convened in 1969, was divided into three work groups – ROADS, BUILDINGS and RECREATION. The Roads group was to “look closely into the Department of Main Roads expressway proposals”. Whether the Department of MainRoads’ study of the section referred to above has led to any decisions since April for a change in the original plans for a tunnel. It took some time before Bernard Smith received an assurance from Mr Morton that “the North-Western expressway through Glebe … will be a driven tunnel”. This would at least have alleviated the great inconvenience caused by open cut construction. “We do not believe that expressways, in themselves, solve transport problems but attract more problems. We do not consider expressways worth the cost of the inevitable social disintegration along the whole route of such expressways. We do not believe that the expressways would stand up to a total cost study in terms of plain economics. We deplore the destruction of the irreplaceable historic fabric of a great city. Parking stations at railway stations. A major ring road system. In 1971 Albert Mispel wrote a passionate protest against the evil effects of the North Western expressway which would have involved the destruction of Lyndhurst House. A Bulletin item in 1972 acknowledging the receipt of a donation of $28 from the Glebe Society to the Leichhardt Anti-Expressway Committee is a reminder that opposition to the expressways was not confined to Glebe residents. Bulletin 2 of 1973 gave notice of an “ANTIEXPRESSWAY MEETING organised by Leichhardt Council at Leichhardt Town Hall”. Development in the recently elected Whitlam government, who was to play a very important part in the eventual defeat of the expressway proposals. Bulletin 5 of 1973 contained a letter from the Society’s president Peru Perumal reminding Mr Uren of his pre-election promises and asking for urgent action to forestall the state government. In reply Mr Uren wrote “It is heartening to me to see your continuing concern for the future of our cities. You can be assured of my continued support for your Society’s efforts to protect the environmental and social values of your community”. The acquisition of the Glebe Estate from the Anglican Diocese of Sydney was partly in order to prevent the state government from resuming land for the Western Expressway. Bulletin 10 of 1973 contained a letter written to the Sydney Morning Herald on behalf of the Society, The Annandale Association, the Glebe Anti-Expressway Group and the Save Lyndhurst Committee, reviewing “the conditions of two of the green bans enforced by the Builders’ Labourers’ Federation – the demolition of Lyndhurst and the construction of the North-Western Expressway.” Jack Mundey, Joe Owens and the NSW branch of the BLF were to prove valuable allies. The Society was not only highly critical of the expressway proposals but in a series of occasional monographs argued for alternative solutions to the problems which the expressways were supposed to solve. The Glebe Society Monograph No 1, by David Potter (ARMIT, B Sc ENG) was entitled An Alternative to Inner Urban Expressways. 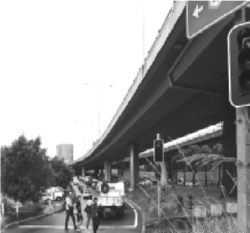 Eric Sandblom, a Glebe Ward alderman on Leichhardt Council and an early convenor of the Society’s planning sub-committee, wrote in the foreword “Traffic counts are taken and projected exponentially to prove that an expressway is needed in the future. Whether it is desirable is not really considered.” The proposals put forward by Mr Potter are for a greatly improved public transport system using both trains and buses. Monograph No 2, A Northwestern Railway by John Gerofi and Jim Coombs, proposed “a development of Sydney’s suburban electric railway system which will serve the NorthWestern suburbs of the city, at present inadequately served by public (or private) transport, at a small fraction of the cost of the proposed expressway development in terms of capital outlay alone, leaving aside the social cost of expressways on the inner suburban environment”. The plan envisaged an elaborate system of light rail connecting with the Eastern Suburbs Railway and running from the CBD through Ultimo, Glebe and Annandale to Leichhardt. The election of the Wran government in 1976 brought a temporary halt to the DMR’s plans but in a publication of the Inner Sydney Regional Transport Group, Stop Them Resurrecting Askin’s Freeways (1986), Stephen Harris, Senior Lecturer in Town Planning, University of NSW, stated that “the transport plans of the mid1980s remain firmly based on those of the mid-1940s – because the DMR has a long memory and has at last talked the government around to the plans it has always had its heart set on”. The price of freedom from expressways is obviously eternal vigilance. Fortunately for us the DMR (now the RTA) probably remembers the fierce opposition to the expressways and is reluctant to revive it. The battle of those two expressways has been won for the residents who would have been affected by them but the war continues. Many expressways, now called freeways, have been built by governments on either side of politics since the seventies, thus encouraging people to drive cars, adding to air pollution and the global warming consequent on the increased emission of greenhouse gases, and leading to the neglect of public transport as we have recently witnessed with the near collapse of CityRail. Traffic congestion in Sydney has reached the stage when it is sometimes quicker to walk from Central Station to Circular Quay than to take a bus. Unfortunately the ALP, as well as the Liberal-National coalition, has succumbed to the religion of economic rationalism whose god is the almighty dollar. In consequence we have had to accept the proliferation of freeways built by private enterprise and financed by the payment of tolls; the latest being the cross city tunnel. What is not so obvious are the hidden costs, such as what the then Reader in Economics at The London School of Economics, E. J. Mishan, in his book Costs of Economic Growth (1967), refers to as the “plague of motorized traffic” as well as the emission of noxious gases and carcinogenic particulates from motor vehicle exhausts; not to mention the noise pollution, the social disruption involved in building freeways and the raising of sea levels as a result of global warming. I’m not suggesting that we should all join the Greens Political Party but it wouldn’t be a bad idea to give some much needed support to Action for Public Transport (9416 8459). It appears from the complete set of Glebe Society Bulletins ( available for reading in the Glebe Library) that in the Society’s first few years the expressways were the most important issue but there were others such as the fight, which we lost, against Pioneer to stop the construction of their concrete making facility at Blackwattle Bay. The Askin government of the day was very pro development but the present state government should be more sympathetic to ensuring public access to the waterfront. Present indications are that Pioneer are planning to vacate their bay side facility but we may need to give them some encouragement to remove that blot on the landscape We are now fortunate to have a Lord Mayor who has an independent voice in parliament and two City of Sydney Councillors who are Glebe Society members so this should help. The Glebe Society played a very important part in saving us from the expressways but there is still much to be done, not just for our beloved suburb but for the wider community and ultimately for our beleaguered planet. Actually 13 people were arrested at Fig Street that morning, 12 young men and the young girl friend of one of them. When we were unloaded into Central Police Station, the men were put in the dock and the girl was sat on a bench adjacent and we waited. Eventually there was a change in shift and the new desk officer saw the girl and demanded to know what she was doing. She, hesitatingly, replied that she was waiting for her boyfriend. At this she was told in no uncertain terms to “get out”. She still hesitated while we in the dock motioned to her to get going. Eventually she realised that we wanted her to go as well and she left. Hence only 12 people were actually charged. The shift change meant that there was considerable confusion as to who was to be charged with what, which eventually worked to our advantage as a number of us were able to prove in court that we were not guilty as charged. For instance I was eventually charged with impeding the passage of a bulldozer whereas I had a series of 7 photos showing me being arrested on top of a roof and being manhandled down to a lower roof and then to the ground, no where near any bulldozers.